Consumers (B2C and B2B) have more ways than ever to consume media and control what content is delivered and when, especially advertising. Consumers can DVR their favorite shows and skip the commercials, or “tune-out” an ad in any medium…traditional or digital. How does an advertisement compete for a consumer’s attention when they are engaged in so many types of media? How do advertising campaigns leverage media fragmentation and quickly changing media habits? How should traditional and digital media be used together for optimal reach of a target audience? Shouldn’t there be an opportunity to expose more people to a message through more channels? frequency, and relevancy, and within budget? 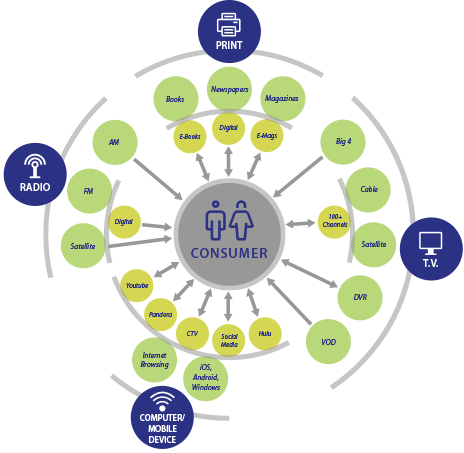 The key to leveraging today’s media fragmentation for higher impact advertising is to understand the unique qualities of each media type as they relate to consumer media usage. We use that insight to outline a media mix tailored to local market and target audience media habits to determine how much budget of traditional and digital media will provide enough target audience reach to achieve the marketing goals. In this multi-screen, multi-channel, Internet-of-things world, consumers have more choices than ever for where to find the news, information, entertainment and other content they want. And advertisers face an increasingly daunting task of where to invest their marketing dollars – both online and offline – to maximize sales and achieve the best ROI. With the advent of programmatic buying and other digitally-enabled technologies, marketers are shifting more of their media budgets to mobile and other digital channels due to their perceived efficiency. The decision of where to invest across different media, however, requires a more complex analysis than most marketers realize and must take into account a wide range of online, offline and non-media factors that create complex synergies and interactions between different media in an effective marketing plan. That’s what Fusion Media is helping marketers accomplish! 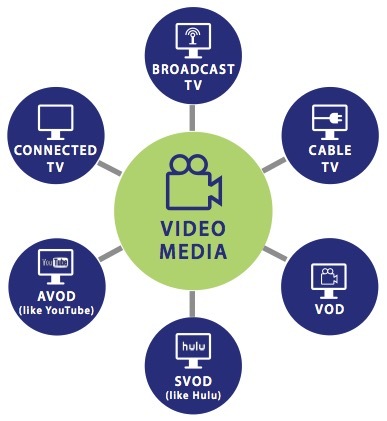 Get the insight you need from your target audience’s use of Connected TV and Linear TV. Know who is watching what, when, and on which device. Let Fusion Media’s team show you how.